The Railway Series is a set of fictional stories about a railway located on the fictional Island of Sodor and the trains that lived on it. There are currently 41 books in the series, the first being published back in 1945. Twenty-six were written by Rev. W Awdry up until 1972. From then on, 1983 to 1996 a further fourteen were written by his son, Christopher Awdry. 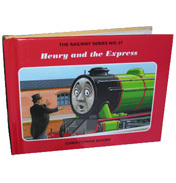 The books are now best known as the basis of the children's television series Thomas the Tank Engine and Friends.